A letter verifying the specifics of the two luncheon sets that Mrs. Horbruck ordered from the student enterprises. She requests a return letter with the specifics of her order in order to completely satisfy her hopes for the order. 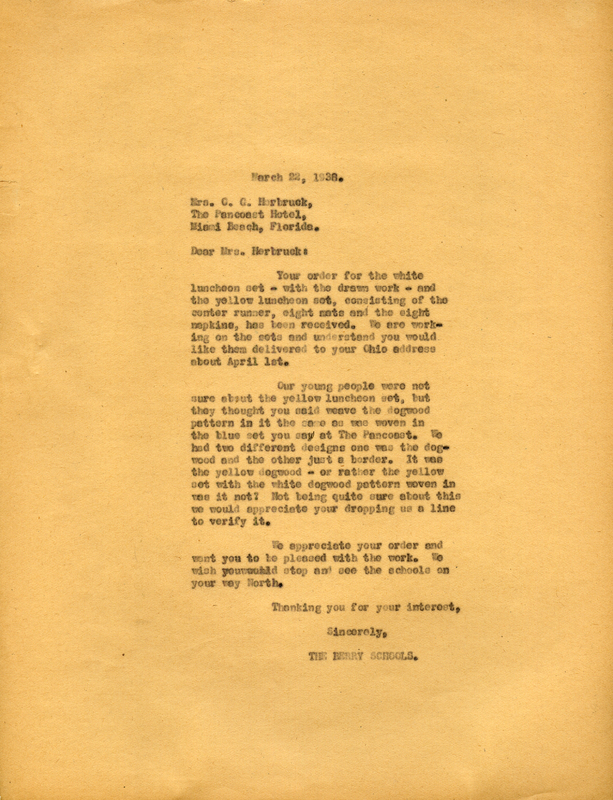 The Berry Schools, “Letter to Mrs. Horbruck The Berry Schools.” Martha Berry Digital Archive. Eds. Schlitz, Stephanie A., Jessica Hornbuckle, Camille Hanner, et al. Mount Berry: Berry College, 2016. accessed April 19, 2019, https://mbda.berry.edu/items/show/14665.